As one of the leading Custom Cabinetry Builders, we have developed an extensive and varied résumé of custom cabinetry for Commercial projects. From coast to coast and urban environments, we have been working on projects with private owners or large corporations as well as Commercial Construction companies. 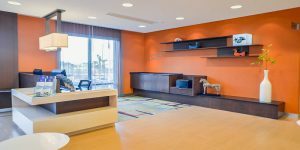 We have been bringing proven experience to all commercial projects such as Hotels, Restaurants, Retail stores, Commercial Offices, Medical Centers, and much more. We stand by our integrated and well-tested system of progress and service.